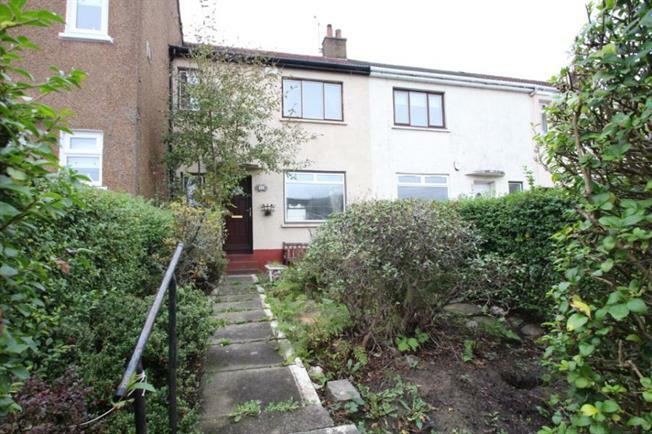 2 Bedroom Terraced House For Sale in Glasgow for Offers Over £79,000. Seldom available in a cul de sac, a two bedroom mid terrace villa within the popular Peterson Park district. There are excellent shopping and public transport facilities nearby including the Great Western Retail Park and Yoker Station. The accommodation, in need of renovation has gas central heating and double glazing. Broad reception hall with WC/cloakroom , the lounge/dining room enjoys double aspects to front and rear. The kitchen offers access to the rear garden. First floor: broad landing with access to two double bedrooms and shower room. Please note, this property is to be sold as seen. Your attention is drawn to the fact that we have been unable to confirm whether certain items are included in the sale of the property and are in full working order.